The Nab Tower is probably best known, at least to cruise ship passengers, as a pilot station, but it is also still an active lighthouse. It could also possibly be worthy of the name “The Leaning Tower of Nab”. This photograph was taken very early in the morning on 6 July 2008 from the deck of Cunard's Queen Victoria as she returned from a cruise to the Baltic. I spent about an hour in Photoshop trying to square this photograph up – but every time I got the horizon straight, the tower was squint, and every time I got the tower vertical, the horizon took on a distinct list to port. Eventually, even my aged brain managed to grasp the salient fact, since the Earth can’t be squint, then the Nab Tower must be. A little bit of Internet research eventually confirmed this fact and I was quite happy. The tower is located a few miles to the south east of Bembridge on the Isle of White. It was originally designed in 1916 and was intended to be one of a chain of similar towers positioned in the Straits of Dover and linked by steel anti-submarine nets, and armed with 4” guns. The idea was to defend allied shipping passing through the Straits from German U Boats. By the end of the war in 1918, only one of the towers was substantially complete and the others were scrapped. 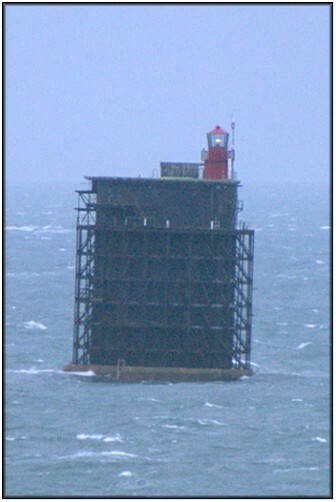 The single, nearly complete tower was equipped with a lighthouse, towed round to the Solent and used as a replacement for an existing lightship that marked the Nab Rock. Once in position, the concrete raft on which the tower was sitting was flooded so that it settled on a shingle bank close to the Nab Rock. Unfortunately, the bottom was not level and the tower adopted a three degree list towards the north east (hence my little difficulty with Photoshop). During World War 2, the tower finally assumed the warlike role for which it had been intended and was armed with 40mm Bofors guns. It played its part in the anti-aircraft defences of the Southampton and Portsmouth approaches and is credited with three and a half enemy aircraft destroyed (the half being shared with a ship). The lighthouse was manned by a crew of 4 until being fully automated in 1983. The light is visible for 16 miles, and the foghorn is audible for two miles.